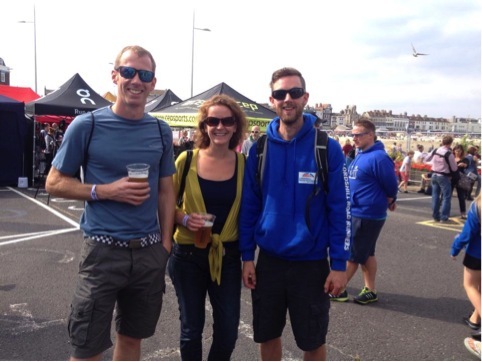 The weekend of Weymouth Half was finally here. Stu and I finished packing and drove down to Weymouth, knowing that Liz and Suzanne were also on their way. We’d booked a hotel room in Dorchester, which is a 10-minute drive away. We thought it would be quieter there and it was also quite a bit cheaper. 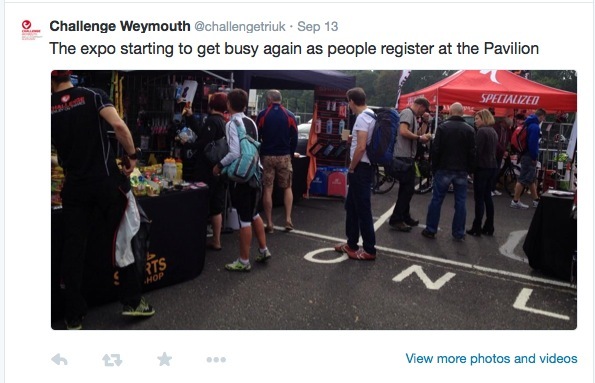 The traffic on the way to Weymouth was quite heavy, so we headed straight into Weymouth to register. We headed towards the pavilion and saw the expo outside. I was a little surprised by how small the expo was. 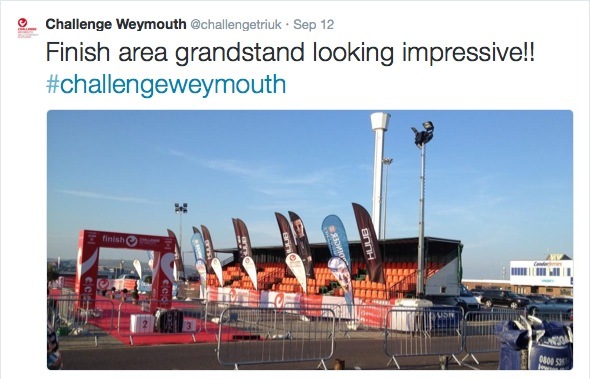 I’ve been to large-scale events like London Marathon and Paris Marathon, which had amazing expos, and to smaller races like Brighton, which still had a reasonable sized expo, but this expo seemed much closer in scale to what is at a local race. I didn’t need to buy anything, but it’s always nice to have a chance to browse new products. We went in to register. I was given an envelope with my race numbers in it, transfers and stickers as well as some promotional info. I also picked up a magazine. We then had wristbands put on, proclaiming that we were ‘athletes’. 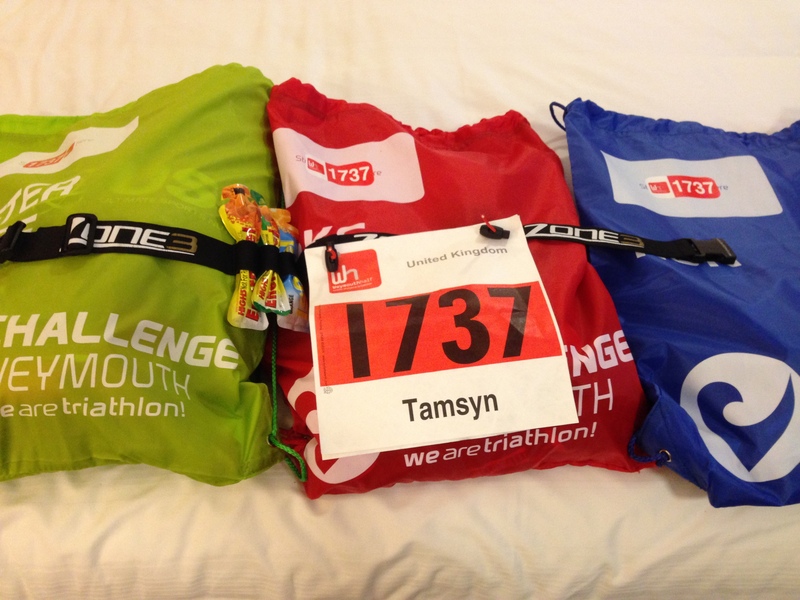 We were then given three bags to include items for the two transitions and one for after the race. We also picked up our timing chips. I accidentally asked for 1787 instead of 1737. Fortunately, we had to run the chip over a mat to check that our names came up. The chip I had belonged to a man, so I checked my number and was able to swap it for the right one. I also realised that I had left my chip strap at home, so we went out to the Huub stand where I bought the last chip strap. We then headed down towards Lodmore Country Park to rack our bikes. 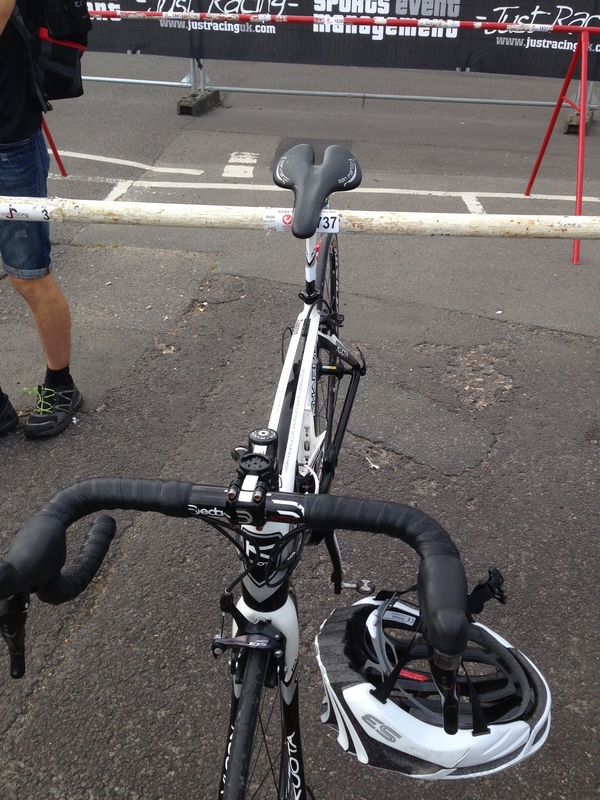 Stu found a nearby car park, so we got out bikes off the roof and attached our race numbers. Unfortunately, I tried to open my bike bag and the zip got stuck. I tried to close it again, but it just wouldn’t budge. Finally, the zip moved, but it wasn’t actually closing the bag. Aaarrggghh! I was feeling really stressed and this was not what I needed. I removed the bike bag and decided that I would try to deal with it later. 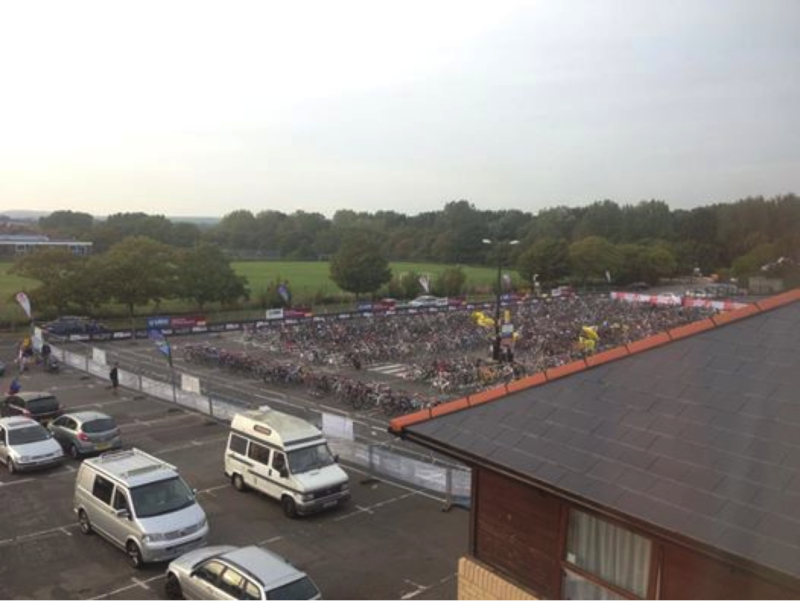 The car park was gravelly, so I wasn’t able to ride my bike. I had hoped to be able to check which gear it was in to make it easier to leave transition in the morning. We queued up at the gate as transition wasn’t open. We then saw James, so went over to chat with him. There was a delay in opening transition, so one of the marshalls came around offering us electrolyte sachets. When we entered transition, we were also given drinks bottles. It wasn’t easy to see where my bike should be racked. There were signs at the end of the rack, but we could only see the reverse sides, which had numbers printed it on them from a previous event. (We were entering transition from the other side during the event). I was able to find my bike at the back of the racks. Bikes were racked on alternate sides and as we were using bags, we could only leave items that were attached to bikes. 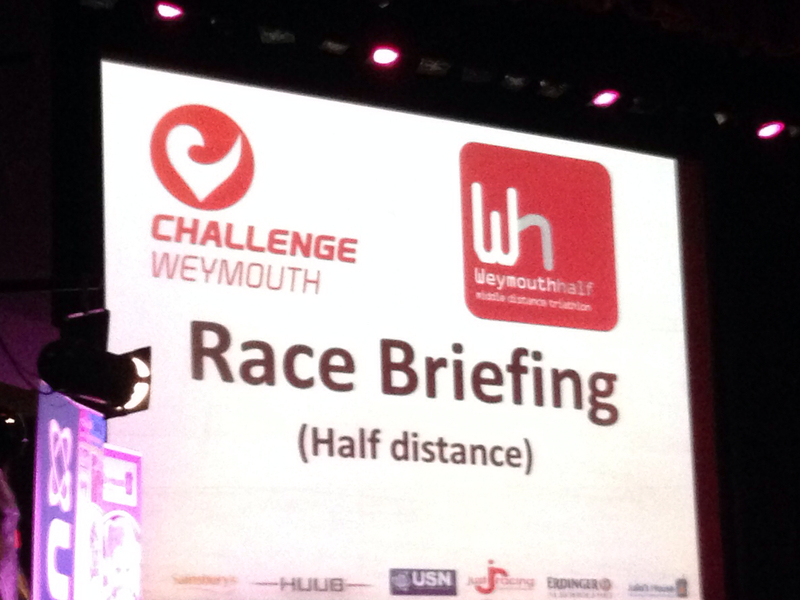 We left our bikes and headed back to the other end of Weymouth for the Weymouth Half race briefing, where we were hoping to meet up with some of our friends. We were running a little late, so James, Stuart and I headed straight into the pavilion. James, Roelie, Gary and Ellie had got there a bit earlier, so they had spent some time sampling the Erdinger Alkoholfrei. The theatre where the race briefing was taking place was filling up when we entered. It seemed like a good place to have the briefing. There were lovely comfortable velvet seats, which makes a change from standing outside just before a race starts! We could see James N, Roelie and Gary sitting in the row in front of us and Liz sent us a text, before coming to find us for a big hug. The briefing was clear and quite reassuring, although there seemed to be a number of people who hadn’t heard that the run was to be 25k/15 miles. The others left to rack their bikes, so Stu and I had a wander around the expo. A local bike shop (Mud Sweat N Gears) had bike bags, complete with a repair kit and CO2 for £20. I was able to try it on a bike that had a very similar seat post to mine and it fitted, so I gratefully bought it and hoped that I wouldn’t need it. Although there wasn’t a lot of choice, the expo had all of the essentials, including a new tyre for Liz and a bike bag for me. Stu was tempted by some flapjack, so he bought a box of 24 for £10 from Dorset Flapjacks. We figured that we would get through them with all of the cycling that we’re planning to do. 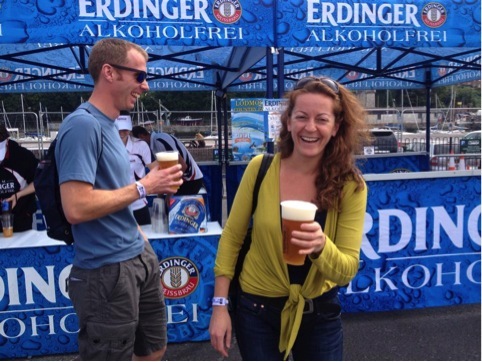 We also tried some Erdinger. I don’t have any photographic evidence of me drinking it, but it’s not for me as it tastes just like ordinary lager. I nearly had 1/4 pint, and I don’t like to see myself as a quitter, but I just couldn’t drink it, so I donated it to Stu. As I was admiring some lovely Salomon shorts, Liz arrived back in the expo. I was a little surprised as I had assumed that she would be at the other end of Weymouth in transition with Suzanne, but she’d had a bit of a disaster. She’d suddenly found that her tyre had perished, so she needed a new one. Fortunately, a lovely chap was not only able to sell her one, but he put it on her wheel and sorted it all out. 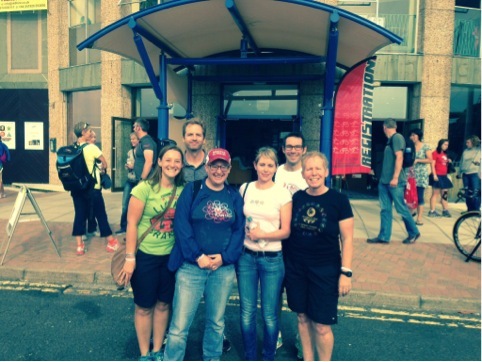 Result – one extra happy, smiley Liz! Stuart and I decided that it was time to head back to our hotel to unpack and get ourselves ready for the big day. We had some food at the nearby Carluccios (the courgette and gorgonzola risotto is lovely!) and then sorted out our transition bags. 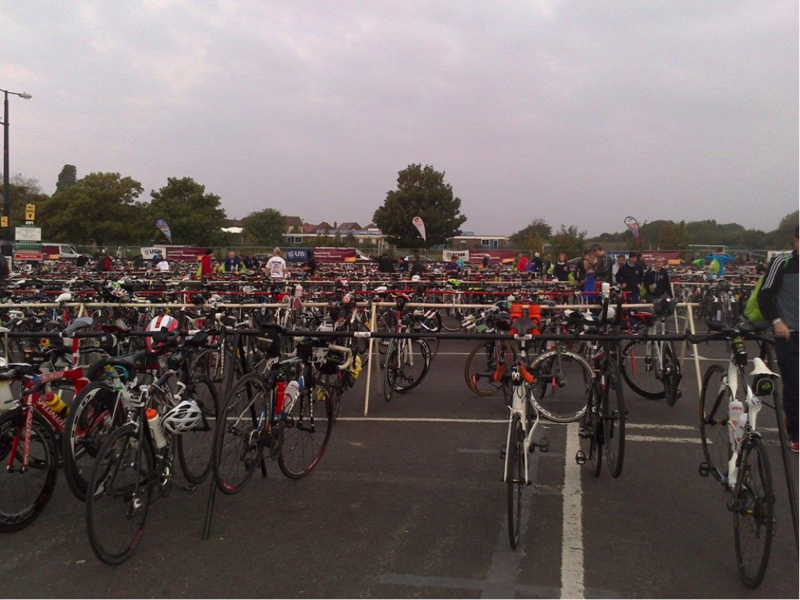 I couldn’t believe how much stuff I needed to get organised for Weymouth Half Ironman. I really included everything. Next time, I probably won’t pack as much! It was then time for an early night! 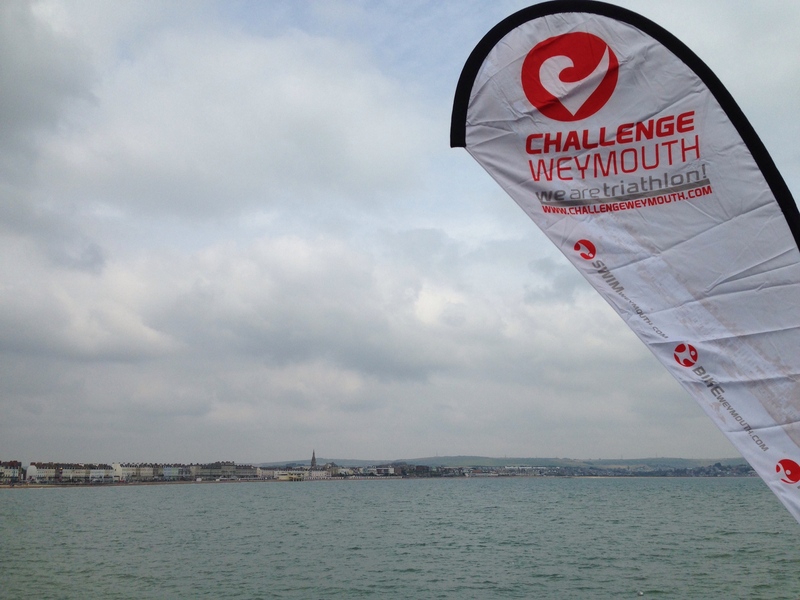 A group from my Triathlon Club did Challenge Weymouth as a relay (or some as individuals) and they all went crazy for those Dorset Flapjacks 🙂 It sounded like a fantastic event, look forward to reading your re-cap. It was a really well-organised event… but writing my recap has probably taken me as long to write as the event itself did! Wow, I never realized how much stuff you need to bring to a triathlon! Makes sense though. It certainly takes a lot more organisation than ‘just’ running. I’m hoping it’ll get a bit easier when I follow your lead and have laser eye surgery. Ooo are you thinking about it?? Yes, definitely. I’ve got very poor eyesight (-7.00), so it would be lovely not to have to wear glasses/contact lenses/prescription goggles. I’m a bit squeamish about the procedure, but the biggest problem that I have is finding a good, trustworthy clinic. I’ve got my final triathlon of the season this weekend and after that I’ll spend some time trying to find the right place for the procedure. Can’t wait to hear how it goes for you. I felt a lot better after talking to several coworkers and friends that had it done and told me what to expect.